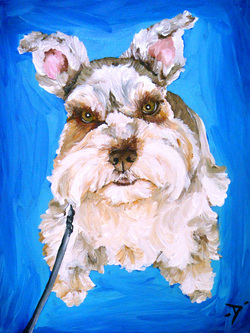 Contemporary Pet Portraits by Dyanna Bruno - MPP Blog! Wow! I cannot believe have fast 2011 went! 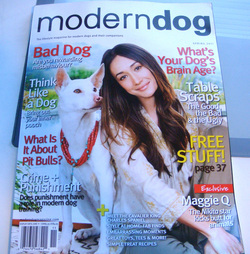 It feels like yesterday when I wrote my last blog entry, but obviously it's been quite a while! Let's see to catch up on things, there were a few contests that happened since September, there was the Halloween Costume Contest where Lily the Batdog won a free pet portrait and that was also the very first contest where I asked a few unexpected facebook friends to help me judge for the final winner. Then there was the MPP Anniversary Bash- that was a ton of fun! Everyone in that contest won something since I felt it was my anniversary, so why not spread the love :) And then the most recent contest was the Pucker Up! 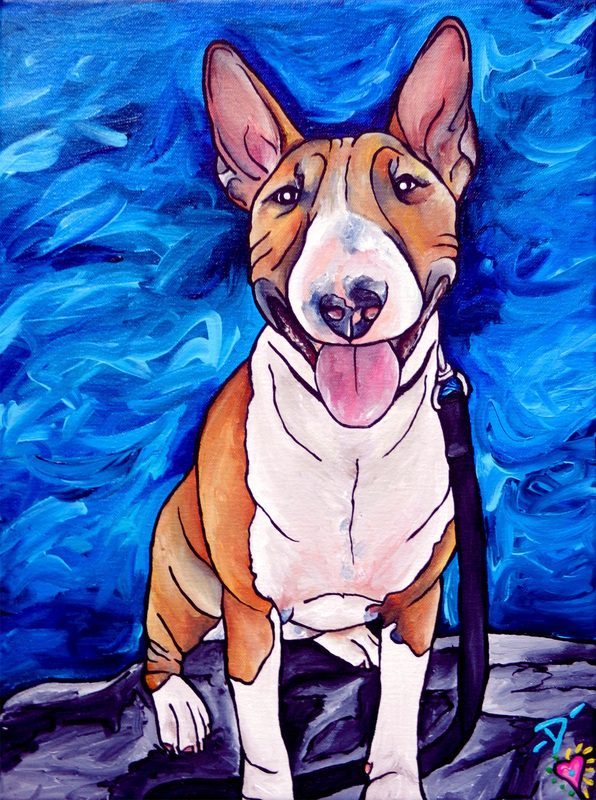 Valentine's Day contest where I again put together a secret panel of judges to help me decide on the grand prize winner, who was Sookie an adorable Bull Terrier who won a free pet portrait. Today I announced that I will be hosting the March Madness contest again this year- last year it was so much fun, that I just had to do it again! That contest will be held for 4 straight weeks and every week there will be prizes and giveaways! Aside from that, I've added a ton of new pieces to my gallery and have plans to start my Barn Yard series within the next couple of months. 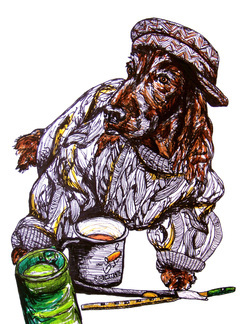 I am so excited to add the barn yard animals to my portfolio and expand my customer base as I intend to display my pieces within high end home furnishing stores as well as galleries and boutiques. I would like to share with you just some of my most recent favorite paintings I've completed. I don't what it is about these particular pieces, but I just keep getting drawn back to them each time I look over my portfolio. I'll leave you with that since I will have plenty to talk about in the next upcoming weeks- be sure to check out my newest trivia game for a chance to win up to 50% off a custom painting! So Many Giveaways & Prizes! The Halloween Costume Contest started out with a BANG! So far, there are 57 entries with plenty of time to still enter! 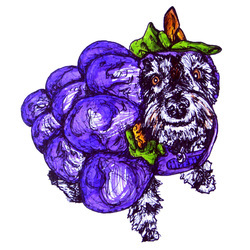 In week one, I surprised 3 lucky Honorable Mention Photo winners with a free ink portrait, those winners were Osito, "The Nerd", Lily, "The Bundle of Grapes", and Malachy, "The Iirish Man". I also offered a great discount for everyone who entered early. 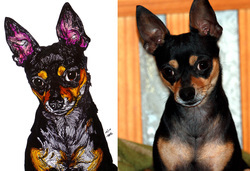 I have a ton more surprises up my sleeve, so the more everyone enters, the more opportunity they will have at winning discounts & freebies and of course the FREE pet portrait at the end of the contest! I'm also hosting my 1st Trivia game. It's only 5 questions and all the answers you can find on my website, but it's a fun way to see who has been following me and for how long. So far, there have been seven contestants and 3 of them got everything correct including the bonus question, so they all received the maximum reward of 65% off a custom acrylic painting or a pre-made painting in my sh. I love playing games and I love to have people win things, it makes my job that much more fun! I also just finished my latest acrylic painting. I still have no title for it yet, it is going to be a sample of a 24" x 24" acrylic painting that someone will win when they are at "The Big Give" fundraiser here in Austin. "The Big Give" is an event where they raise money to go to a selected organization that gives back to the community. In a sense it is a 'pass it forward' for them to give money back to these organizations that have given so much. 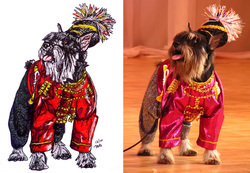 I love that they reached out to me to be a part of the event, I believe I will be the only pet portrait artist so I am very excited to see my work displayed at the W Hotel. I will post some pictures of the painting later today, so make sure to check out the paintings gallery to see more up to date work! 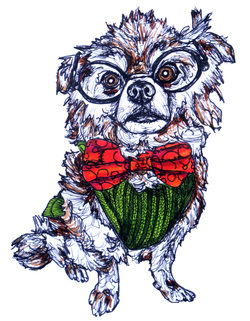 In addition to the Halloween contest, I am still running the "Christmas in July" specials, which I think host some amazing opportunities for custom portraits, scrapbooks, picture frames, etc.... With Christmas creeping up, it's a great way to get a head start on holiday shopping and who doesn't love when someone thinks about their fur babies? Those specials are ending August 30th, so only 5 more days to get your orders in. I've also been a busy bee in the studio this summer. With everyone on break, it gave me some "free" time to work on some special paintings for a local rescue shelter out here, Austin Pets Alive. They recently opened up a new cat location in Tarrytown and I was asked to help furnish their new building with just cat paintings. 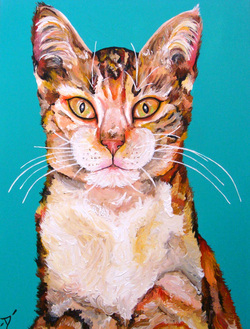 At first, I can't lie, I was kind of dreading the task since I mainly paint dogs, but once I got into it, I really loved painting the cats and kittens. I didn't realize the amount of color depth they held in their coats and I just loved experimenting with the color palettes. I have six pieces completed so far and two left to go, so I am almost finished with that project. What was so special about this project for me was not only to help draw attention to their new location, but I also got to work side by side with Angela Lozano a pet photographer out here in Austin. We have been putting together a partnership over the last couple of months to work hand in hand if someone wanted to ordered custom photo's and a portrait. To have two different mediums to be able to hang on your walls I thought was just so cool and I have really enjoyed working with her so far. She took some amazing photo's of my two boys, Ruccus, my 12 year old pit bull, and Horton, my newest rescue, a 1 year old shih tzu mix with ewok, lol. I have a link on my home page if you were interested in seeing those photo's. If you follow me at all on Facebook, then I am sure you saw me posting photo's galore like a proud mom! Some things to look forward to at the end of the year. 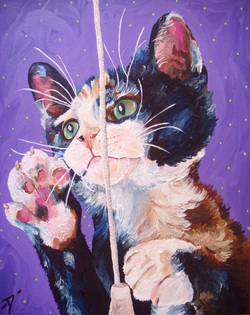 My Paw Portrait's 2 year anniversary bash- that will be on November 14th- and I plan to make that HUGE!!! Which means, no Christmas contest, but I promise it will be worth it. I will also be donating a 24" x 24" custom portrait to "The Big Give" here in Austin. That is going to be a pretty large event that I am excited to be a part of this year on September 25th. I will also be at the Dogadillo Howl'oween Rescue Spooktacular on October 23rd at The Hill Country Galleria Mall Amphitheater, so please come by and visit my booth if you are in that area. So, lots of events coming up and I am sure some unexpected ones will make their way into my schedule, but I am already planning now for my Anniversary Bash. So make sure to stay up to date on my website especially on Facebook since I am one there pretty much everyday announcing new pieces, new prizes, and new specials. Thanks for following! I am sure many of you watched Oprah's final show today and I was so struck with what she said in the beginning of the show about having a calling. I never thought of myself as having a calling. I always knew that I liked to please people and I know that started about the time I entered high school. I would do little things, like bake cookies for my friends or plan a day of fun if I knew they were upset. I never really wanted anything, but I always wanted to give when I was able to. I even remember when I went away to college, I was like the "mom" to my roommates or closest friends that went to the same school as me. I would bring them chicken soup if they weren't feeling well, or plan dinner & movie nights at my house...probably because I knew that I missed that about home, that I figured they must of too. But there was always a sense of genuine happiness after I did any of those things because I like to make people happy. Making people happy, makes me happy. And when Oprah said, "What sparks the light in you, so that you in your own way can illuminate the world," I just froze in that statement. I am not looking to change the world, I just know that I am able to make a difference in someone else's world that in turn makes my world a little brighter. 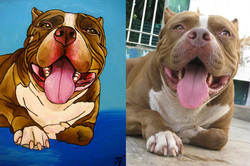 That's why I love doing pet portraits. I know it is a luxury that most people don't think about spending their money on, but there is just something so special that helps me feel connected to people when they allow me to be a part of something so intimate to them. 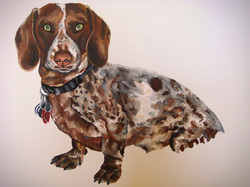 If someone has lost a pet and I am painting a memorial piece, I know that what ever the end result of the painting or drawing will be, that they will be so grateful to have such a special piece that in turn I am honored to be a part of making that moment happen. I have not met most of my fans, I could probably count on my hand how many I have actually met in person. This astonishes me everyday that you all stay connected and watch as I grow my portfolio and I am almost confident enough to say that by this point, you all can see the amount of love and dedication that I give to each of my portraits. I cannot express to you the gratitude that I have for you guys allowing me to be a part of your lives and giving me the gift of being able to share my artistic talents with you. 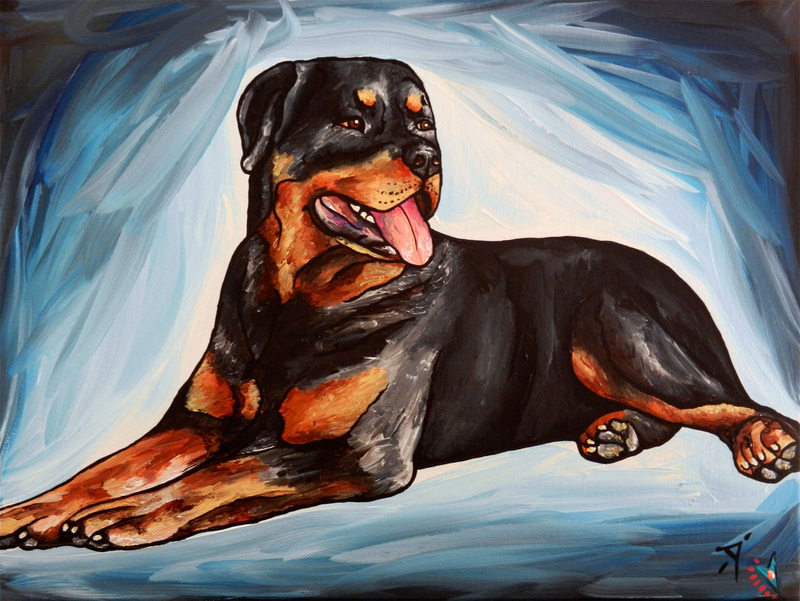 I never thought I would be painting for anyone other than my friends and family, but with your support from literally around the world, I have been able to make My Paw Portrait a part of your home. So I guess my final words for today would be that if I took anything from Oprah's speech, it would be that the light that is sparked within me when I paint, illuminates your world when I am able to share and give that light to you. Thank you. Didn't realize I haven't blogged in quite a few days. Well a few things have gone on since I last left you all. I started some of the March Madness "photo of choice" winner paintings. 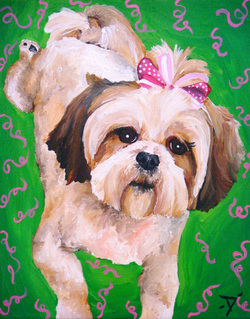 I was able to complete Foxy Roxy, the shih tzu that won week 2 and Jack, the schnauzer from week 3. 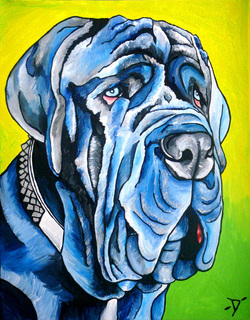 I also added a few new pieces to my gallery, Rufio the Napoleon Mastiff and also Wilson a Cockapoo. 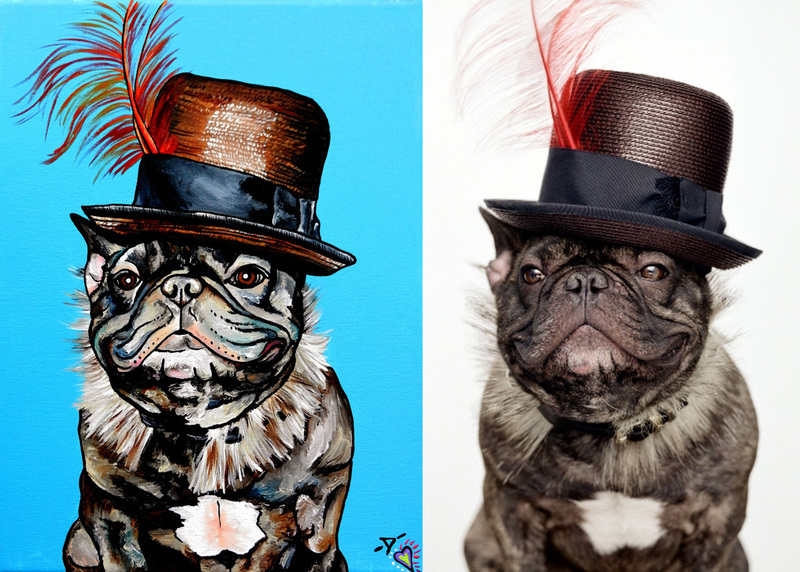 Rufio was so much fun to paint with his endless amount of wrinkles and also his owner and I put together some ideas of adding metallic silver paint to his painting, which doesn't show too much in the picture, but I promise it is there. We also discussed the background and she is a fun lady with bold tastes, so we went with the lime green blended into the bright yellow. 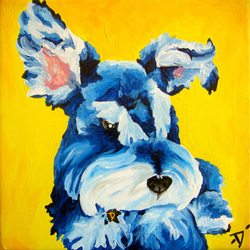 She also posted his painting on his website called Rufio's Rumblings. You can find the link on my "My Fav Links" page. 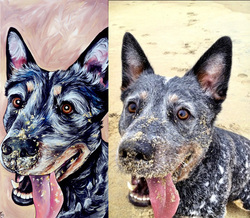 Wilson was also a lot of fun to paint and he had the cutest face. 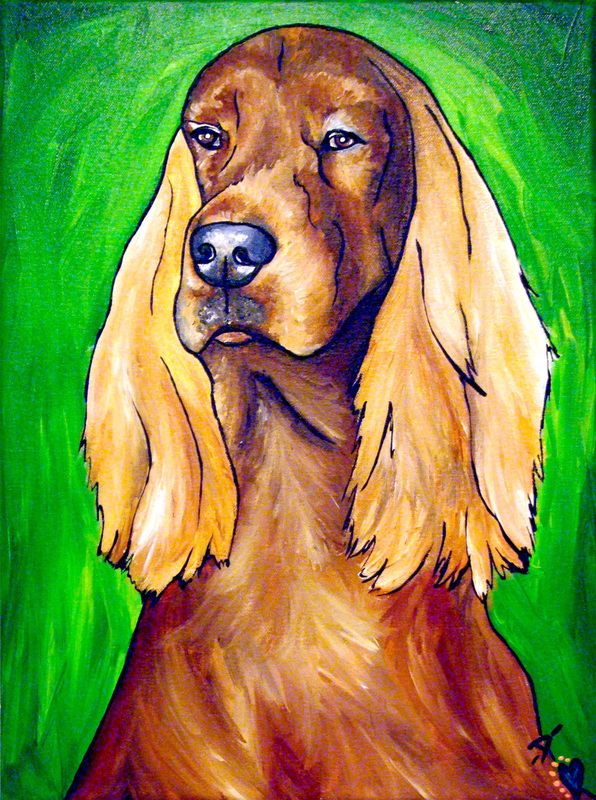 I first painted his background in a popping 2 tone yellow so that his owner could see what it would look like, but we ended up finalizing the piece with this soft green/blue background that I think works equally as well. 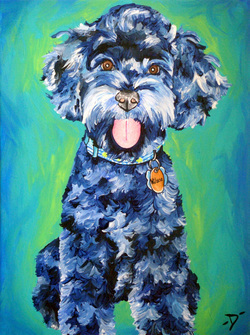 I made sure to blend a lime green with a soft turquoise and then used a hint of blue around the edges to draw back in the blue tones of his coat. 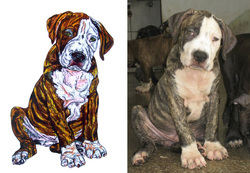 I have so many different types of breeds on my list to paint that I am very excited to start showing you all the next couple of pieces. 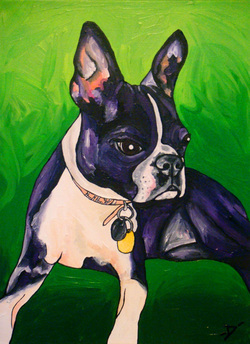 I also have a new painting that will include more than just one subject, it will include 3 dogs and a dog house and a few extra special touches. 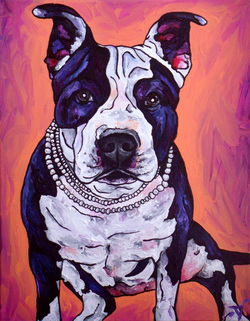 That one is going to a client that will be opening up a new doggie daycare center and I am honored to be a part of her shop and have my painting as a representation of her new store. I also will be painting a monkey as well! My first monkey to be a part of the My Paw Portrait gallery. If you were following the March Madness contest, then you would remember Kumiko Jade, the monkey that won week 3 for the most "like" votes. Some upcoming events are also going coming into effect. 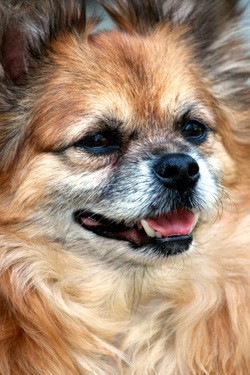 On May 15th, I will be attending another Austin Pets Alive! event out here in Austin, TX to help support my local rescue organization. I am donating the painting of "Monty" the beautiful chocolate lab on a 12x16 canvas towards their silent auction since the last piece I donated "Sleepy Head" helped raise a lot of money. The event is called the Wagathon Walkathon (I have all the information on my home page) and I will be outside in the courtyard of The Galleria Mall with a photographer here in Austin, Angela Lozano, to help promote both of our products and some package pricing for the two of us. I was really upset today because I was going to have a photo shoot with her shooting my dog Ruccus and I, but unexpectedly I discovered my ceiling was leaking and then did some Sherlock Holmes investigating and found out my AC went out and is still leaking even after I turned it off- so no photo shoot today, but sometime soon. And when I do the shoot, I will for sure be posting the pictures on my website as well on my Facebook page with her link if you are interested in working with this brilliant photographer! So May has not even popped up yet, but there are so many projects to be done and I am just super excited to get started and post some work in progress photo's for you all, so please stay tuned to both my Facebook page as well as my painting gallery on my site to see some new and exciting pieces! March Madness is finally over and I am a little sad. 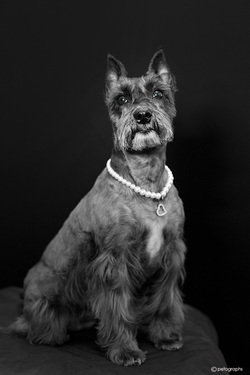 Every week I had a handful of contestants who would submit a photo of their pet and I felt like I was really getting to know my fans and their pups stories. It still amazes me how we can all be from a different place and yet we all have this same common ground. I bet that if we lived near each other, we would all most likely be getting together over a weekend, doing a little BBQ, and bragging about how cute our dogs are and what they did over the week that was funny or mischievous. Picking the "photo of choice" winners from each week was a lot harder than I had anticipated. I was able to narrow it down to at least 2-3 per week, but then I just could not choose the tie breaker. So I had to result to putting the names in a hat and seeing who's name came out. It was so close though, I had a few names that were runners up for more than just one week. I wish that I was able to paint them all and offer them all free portraits, but I have to be realistic and know that I will be hosting more contests in the future. 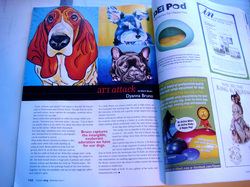 The contests are fun and it gives me an idea of where people are talking about My Paw Portrait and spreading the word. But it's mostly for me to give inspired by new dogs and their unique photo's, so even though someone might be winning a free or discounted portrait, they are helping me to stay inspired. For April, I plan to take the month to catch up on my commissions, as well as, painting and drawing the winning portraits from March Madness. I'll most likely have a 2nd annual Yay! May! 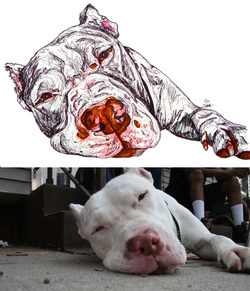 Pet Portrait Give Away! since it was a blast last year, especially since Ruccus picked the winner. He will have to make a cameo appearance again, however I will have to think of a new innovative way for him to choose the winner. I think that is the most fair way for a contestant to win the contest, the fact that it won't be based on Facebook "like" votes and it gives everyone a fair chance at winning. 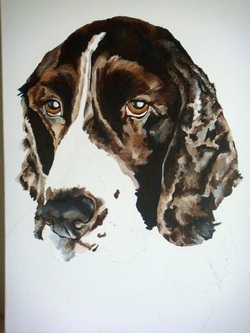 But enough about the contests- I said I would share some work in progress photo's as I worked on my commissions and I just completed a portrait of a dog named Dexter who lives in Canada. 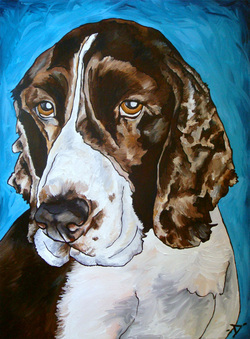 He was gorgeous and so much fun to paint since he was on a large canvas, 18" x 24". The only requests from the owner was to have the background color match his blue binky. 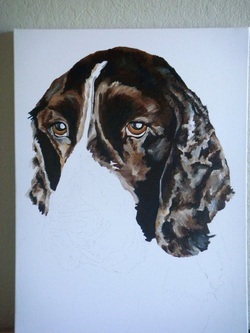 He took up most of the canvas and I wanted to pay special attention to his soulful eyes and soft brown and white coat, as well as his big floppy ears. In the first image of the work in progress, I was working on his head and ears and really trying to capture texture in his coat through his ears since he had these little fly away hairs. 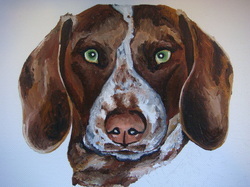 In the work in progress 2 photo, it took me forever to capture the right colors and texture for his nose. I kept blending the black, with unbleached titanium white, and then some burnt sienna and burnt umber with a little bit of the flesh tone pink until I finally achieved what I thought looked like his nose. It's interesting because when I blew up the image of his nose, he had so many colors there in different highlighting areas that it might not look like there is that many colors in his nose, but there are. 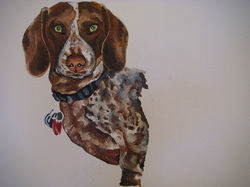 I also mixed some turquoise with the brown tones to create the depth in his coat around his face. And whenever I work on a piece, regardless if I think a section is done, I inevitably wind up going back to that section and making it darker or lighter because of whatever new element I've added had made that area to look muddy. 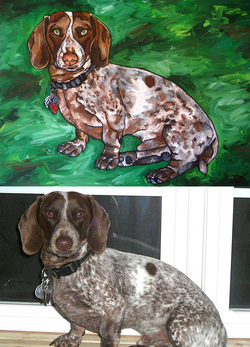 Then you have the completed split screen photo and a larger image of the completed painting. Here you get to see the punch of blue in the background to match his blue binky. I've always loved how blue tones up against brown tones create a beautiful harmonious relationship within a piece. I can always paint funky and bright colors, but I love how soothing these colors are and how they are a bold in their own way. 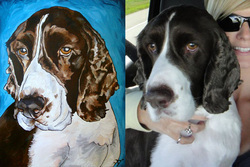 I was very pleased with the way Dexter came out and his mother is eagerly anticipating her custom painting!